If you haven't seen it, you should. I would say one of the better films released in the past two years. And JK won a shiny trophy for his performance a couple months after our Bucks! And well deserved. That was incredible acting on his part. There's only one thing worse than a ludicrous, shallow, artificial movie, and that's a ludicrous, shallow, artificial movie that everybody seems to adore. Even worse, the finale leaves us with this unmistakable message: sadistic leadership is the way to greatness. Don't take your kids to see this. It was the first review when I went to IMDB so I had to bring it here. I haven't sent the movie. I'd say Chic's probably right in his comment below - that it was incredibly entertaining but maybe not super grounded in reality. Well, it was entertaining, but I used to live in that world, and its pretty inaccurate. Believe me, no musician gets faster at his craft by sweating, grunting, and having someone holler at them. Speed comes from calmness, acuity and purpose. Loved the movie though, tremendously. And that's my music. yeah. i agree. my teachers in college were always trying to intimidate us though. there were times when a freshman would be so nervous and his hands would shake so bad that he literally could not keep them on the neck of the guitar. I was a composition major and my primary instrument was classical guitar. my comp professors were super nice and laid back. my guitar professors were much more intimidating and demanding. you better believe I spent the vast majority of my time practicing guitar rather than composing, just because I didn't want to disappoint my guitar professors. They were intimidating but never angry. they just thought that we had to get used to playing under pressure, for some reason. But it was nothing even close to the intensity in the movie. It really was. Absolutely incredible. That's exactly why it didn't. Awesome! Thanks my man. My dream is that D.J can do an interview with him someday. It would be epic! Awesome video thanks for sharing. This is my go-to picture when my friends say something bad about Ohio State in a group text. They hate it. I love it. Katie Nolan needs a better gig. I actually watched her for the first time last night. Agreed, she's got that 'it' factor. Yeah. That was my first thought. She was great. Thought I'd put up this picture too. 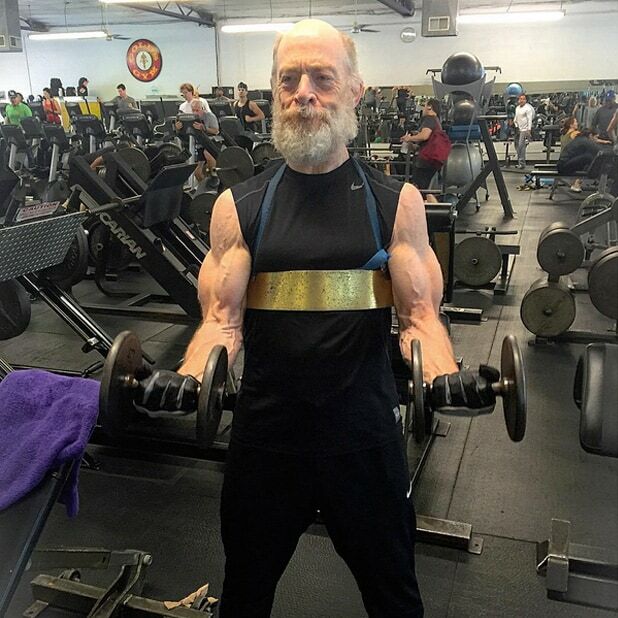 Looks like he has been working with Coach Mick as he gets ready for Justice League. 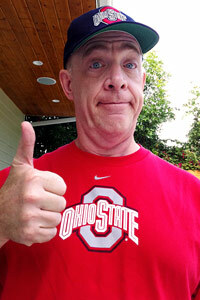 Saw J.K. Simmons, but read as J.K. Dobbins... facepalm. Don't feel bad. I did the same. I completely understand JK as a sports fan. My entire family is from Detroit. So I am a huge Wings fan. Cheer for the Tigers. But went to Ohio State and love my Buckeyes. Love that he would rather take 5 years off than see Michigan win a title. Priceless. JK: I'll take a year off. Katie: What bout not acting for 5 years vs Michigan winning a National Championship? JK: My wife and I have some money saved up. I didn't even know he was a Buckeye fan until a few years ago. Already one of my favorite actors, his fandom a bonus. His character on Oz was so creepy and evil. Yes he was, but that whole show was scary. Instead of having the "Scared Straight" program for troubled youth, they should just make them watch a few seasons of "Oz". That was awesome! As a movie fan and of course Buckeye fan, it's great to see the two mix. It is weird seeing him do the Farmers Insurance Commercials after his character in OZ. He is an AMAZING actor to be able to pull all that off. Kind of like watching Ted Levine do kids movies. Speaking of Buckeye celebrities, it's a damn shame that Richard Lewis' relationship broke down. Thee apologized for the stupid mistake (a student described him as a "drunk" in an official publication) but he hasn't been at any games or as noticeable in his Buckeye love as before.